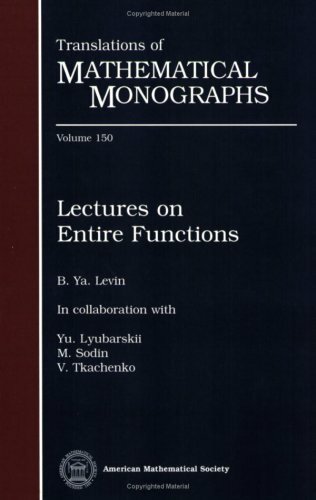 This monograph aims to expose the main facts of the theory of entire functions and to give their applications in real and functional analysis. The general theory starts with the fundamental results on the growth of entire functions of finite order, their factorization according to the Hadamard theorem, properties of indicator and theorems of Phragmen-Lindelof type. by Georges Valiron - Chelsea Pub. Co. These lectures give us, in the form of a number of elegant and illuminating theorems, the latest word of mathematical science on the subject of Integral Functions. They descend to details, they take us into the workshop of the working mathematician. We shall develop in this course Nevanlinna's theory of meromorphic functions. From the table of contents: Basic Theory; Nevanlinna's Second Fundamental Theorem; Univalent Functions (Schlicht functions, Asymptotic behaviour).